Trade Book with slate gray linen hardcover and glossy dust jacket, size: 6x9" (15x23cm), 80 pages, more than 65 images, self published, print-on-demand via blurb bookstore. From the foreword by Georg Barkas (professional artist, educator, writer and researcher in the field of Japanese Rope Art): "… I wished to avoid a mere description of the pictures, and I do not want to tell the ‘reader’ what they will find in the book as this would rob them of the opportunity to form their own opinions. Furthermore, the collection of Tom’s photographic art is so diverse that it is hard to find the continuity which is so often demanded in various fields of art. At the same time, it is exactly this lack of continuity which makes it so interesting … "
On October 31st 2018, the 100th anniversary of the death of Egon Schiele, I published my most complex project to date. 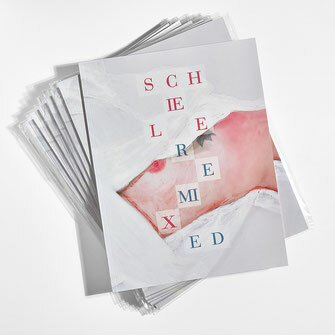 Schiele Remixed goes beyond a mere photographic replica of Schiele's works. It differs from what others have tried with icons of the Wiener Moderne and the Wiener Secession, in that the entire project is analogue, completed without elaborate sets or post production, manipulated by hand rather than by computer. It is a bright and twisted homage both to Schiele's process and his results, each work subject to the conditions of its creation, imperfect and unique. Only €11 until Dec. 31st, 2018 (afterwards € 16,50). Original artworks or fine art prints available, contact me for terms and pricing.